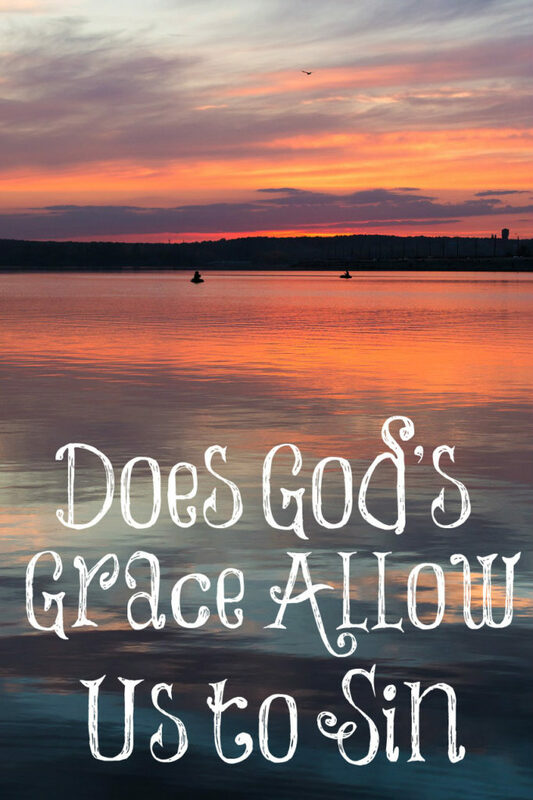 Does God’s Grace Allow Us to Sin? Some women have told me that I don’t show enough grace in my posts. I focus too much on teaching women how they are to live their lives: be sober, love and obey (and submit to) their husbands, love their children, be discreet, chaste, keepers at home, and good so that “the word of God be not blasphemed” (Titus 2:4, 5). I teach women to not teach men nor be in authority over them and to be silent in the churches (1 Timothy 2:11, 12). If they have a question, ask their husbands at home since it is shameful for them to speak in the church (1 Corinthians 14:34, 35). I teach them to be modest, shamefaced, have meek and quiet spirits, and if they are married to husbands who don’t obey the word, then win them “without the word” (1 Peter 3:1) by their godly behavior. Many women don’t like being taught these things and being told what to do, even Christian women. They cry, “Where is the grace?” and “You are judgmental!” Grace doesn’t give us the license to sin. “What shall we say then? Shall we continue in sin, that grace may abound? God forbid. How shall we, that are dead to sin, live any longer therein?” (Romans 6:1,2). Yes, we still sin and His grace covers our sin but we should never willfully sin or practice sin as believers in Christ Jesus (Read 1 John). We will fall into the mud but we need to jump quickly out, remind ourselves that we are dead and freed from sin (Romans 6), and begin again to walk in newness of life; for He has rescued us from the dominion of darkness and translated us into the kingdom of His dear Son. What is our reasonable service for all He’s done for us? Is it to continue to live in sin and keep reminding ourselves that His grace covers us? NO! “I beseech you therefore, brethren, by the mercies of God, that ye present your bodies a living sacrifice, holy, acceptable unto God, which is your reasonable service. And be not conformed to this world: but be ye transformed by the renewing of your mind, that ye may prove what is that good, and acceptable, and perfect, will of God” (Romans 12:1, 2). What is that good and acceptable and perfect will of God for women? It’s clearly outlined in the first paragraph of this post! He wants our obedience to His commands since His commands are for our protection. They are boundaries and they are good. We are commanded to exhort (to use words or arguments to incite to good deeds) one another daily (Hebrews 3:13), especially as we see the day approaching; for the deceitfulness of sin hardens hearts and sin must be warned against continually because we forget Truth so quickly. Satan’s goal is to kill, steal, and destroy so I am going to continue to teach Christian women to be godly women who walk in newness of life and obey God in what He has asked them to do. It is our reasonable service. It’s the least we can do in return for what He has done for us and it’s for our protection. He is our Creator and He knows what is best for us. Thank you, Suzanne. I very much appreciate your encouraging words and support! Exactly. One of the reasons that we have so much sin (suffering, pain and death) in the church and soooo many immature Christians who are more focused on grace (whining about being judged) than they are on holiness is that there is not enough teaching and admonishing of the Word among us. Our goal as Christians is to become more and more like Jesus Christ every day. That is the sanctification process! The goal is to become perfect and complete in Christ! The only way we are going to become complete in Jesus Christ is to learn and follow His instructions for us and the Bible tells us that we need to help each other by pointing out the sins in each others lives and warning each other of the danger of sin (which results in suffering, pain and death) and encouraging each other to repent and live according to Gods Word. Jesus tells us here how important is it to NOT tolerate sin in the Church body and that if those who call themselves Christians refuse to repent when their sin is brought to their attention that they are to be put out of the church and not even associated with! SIN IS SERIOUS BUSINESS and must be dealt with within the body of Christ! Titus 2:3-5 specifically tells the older women not only that they need to be teaching the younger women, but also exactly WHAT they need to be teaching the younger women and that is exactly what Lori is doing! The ladies who complain about Lori are so deceived and blind in their PRIDE they don’t even know what is good for them when they see and hear it. They do not understand the DANGER they are in and how Lori is just calling out to them; trying to warn them of the pain, suffering and death they are bringing upon themselves and their husbands and their children; not to mention the fact that by calling themselves Christians, yet continuing to live their lives in willful ignorance (of Gods Word) and sin, their lives do nothing but blaspheme (bring reproach upon) the Word of God. Most women do not see the damage they are doing until it’s too late and even when their house (family) has been completely torn down (by their own hands), some still do not see what they have done because they are so blinded by their own selfishness, pride and sin. Lori, thank you for continuing to be faithful to God’s Word and I continue to thank God for you and your faithful service to Him. You’re welcome, Trey, and thank you for adding your comment that is full of biblical wisdom. Thank you, Lori and thank you, Trey for speaking truth….YES!!! I’d rather hear the truth than be lied to. If the truth offends me, I’m thinking it’s not the truth that’s the problem. Keep teaching and preaching … the world has turned a blind eye to acknowledging that sin even exists. This is God speaking to Job in 40:7-8 …but what about what? “I will question you, and you shall answer Me.” God is confronting Job about the error of his way. Those that will not be confronted by His Word have annulled His Word, have condemned God, and have justified themselves, justified their words to ‘be as the Most High’ …NOT coincidently as did Lucifer in Isaiah 14:14. Not good. This too was Eve in the Garden: her ‘Well no’ response to the serpent’s “Hath God said?” …thus she declared God condemned. These are the women you refer to in your posts and chat room that take exception to you confronting them with the Word of God …with the beauty of Jesus Himself. God is not their Father, but Satan. May you be highly praised among women, Lori. You continue to withstand the test of being hated. You are among the daughters that prophesy …to women …about our glorious God, and their God too …if they will have Him. Keep teaching God’s word! You are appreciated!!! Wow – I love this post full of truth and those comments by Dave and Trey. I definitely agree with what you say here. This topic has actually disturbed me lately in terms of my salvation. I used to have this same concern and eventually got over it but basically my concern is that even though there are a lot of saved by grace passages, there’s a lot of passages that seem to reuire some undefined level of works. I don’t have a particular sin I’m thinking of, perhaps negative unbiblical thinking, but I feel like what if in a bad moment or season I die? Will I think I’m covered by Jesus but Jesus says I never knew you? Further confession, in my response video to your debt free virgins without tattoos I mostly supported you but did give you thi criticism what I meant was you didn’t put much fluff expressing what to do if you did those things or empathizing but I loved how you presented your follow up bout no tats.